Bajamar was conceived in 1975 by Grupo Valcas which initiated the planning, development and construction of the Bajamar Ocean Front Golf Resort. Grupo Valcas ran the gauntlet of obtaining the necessary permits and creating a master infrastructure that boasts a network of all underground basic utilities. Grupo Valcas initiated the project by developing the first 18 holes of the 36-hole master plan ocean view golf course and a Club House. Bajamar opened to the public in July 1976 and was immediately recognized by FORE magazine as “The Pebble Beach South of the Border”. In 1991, Grupo Valcas joint-ventured with another hotel-resort developer to develop the remainder of the property. Most noticeable improvements from this effort are the 81-room hotel adjacent to the clubhouse and the spectacular Oceanó course that increased the dramatic beauty of the original layout by adding 4 holes that run directly across the impressive ocean bluff of Baja. 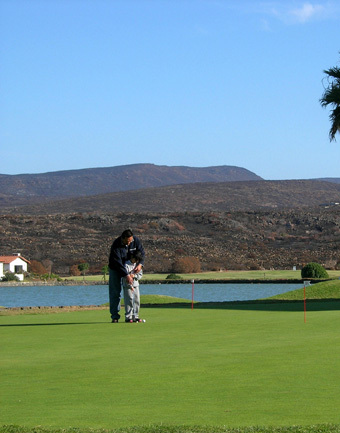 Today, Bajamar has approximately 600 homes completed; a 15,000 square foot clubhouse with full luxury amenities and services; an extensive network of cobblestone streets; an impressive guard gated entry that emits a grand sense of arrival; and a reputation that lures thousand of golfers annually to test their abilities against the “Best of Baja”. After a series of financial restructuring accomplishments, three large Mexican development groups presently own Bajamar. Grupo Mega Turismo, based in Mazatlan, controls the central section of the community including the golf course and the Hacienda de Bajamar Hotel; the condominium building group Bay View Grand owns the northern fraction of the development where the new La Punta and La Costa at Bajamar projects are under development, including an 18 hole Greg Norman designed championship golf course. Grupo Valcas owns the southern portion where Bajamar Punta Diamante is taking shape with the beautiful Santa Barbara at Bajamar condominium project leading the way.